Jottacloud users can hide the images and videos they don't want displayed on the Photo timeline. Keep reading to learn how you can hide images and videos. 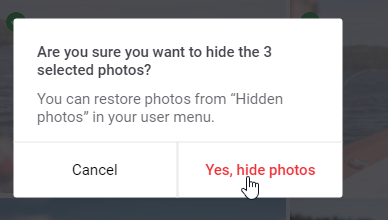 Confirm that you want to hide these images from the Photos timeline, by clicking "Yes, hide photos"
The photos wil now be shown in the Photos timeline again.